Online orders received by 3pm (Sydney time) Monday to Friday, are usually shipped that same day. Calculation or estimate of shipping charges is part of this sites "Checkout" process and is displayed before your order is sent. The charges account for the shipping destination as well as the weight and volume of your order. Shipping charges are intended to cover overhead costs associated with processing orders, handling, packing and shipping products to you. Shipping charges are based on the weight, volume and destination of the order, not just the value of goods. Should the web site calculated charges vary significantly from our actual costs we will contact you prior to processing your payment and request adjustment. 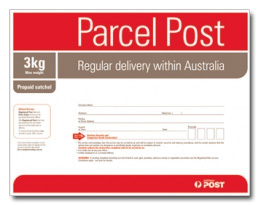 All our deliveries are sent using Australia Post - Parcel Post. We have chosen this method as we believe it to be the most reliable method of delivery. Once all payment has been received and processed, your order will be dispatched. Please allow six (6) working days after the placement of your order before contacting us. If you do not receive your order at the expiration of six (6) working days, please telephone us on (02) 9525 1777. It is important that you check the accuracy of the details you enter into the Delivery Details section during the checkout process. Please note it is your responsibility to supply the correct delivery details as we cannot be held responsible for incorrect details resulting in unsuccessful deliveries. As per Australia Post delivery guide, all deliveries (for all metropolitan areas) should arrive within a maximum of 6 working days from the date of dispatch. This time may vary depending on the area in which the item is to be delivered. Local deliveries often are within 2 days. Please note that The Stanless Shop will not be held liable for any postage delays incurred by Australia Post. It is your responsibility to advise us if the parcel has not been delivered. If an item is lost or not delivered, The Stanless Shop will investigate the matter with Australia Post. Then, depending on the outcome of such investigation and at the discretion of The Stanless Shop, a replacement item will be sent. Furthermore The Stanless Shop will not warrant the cancellation of an order as a result of delays with Australia Post. Please note that The Stanless Shop will not be held liable for any postage delays as a result of Australia Post peak period delays. It will remain your responsibility to ensure you take into account possible obvious delays with Australia Post such as Christmas, New Year and Easter, whereby Australia Post regular delivery guide (maximum 6 working days for Metropolitan areas) may not apply. For further information about Christmas postal delivery times or tips, contact the staff at your local Australia Post Branch, telephone 131318 or visit www.auspost.co.au.